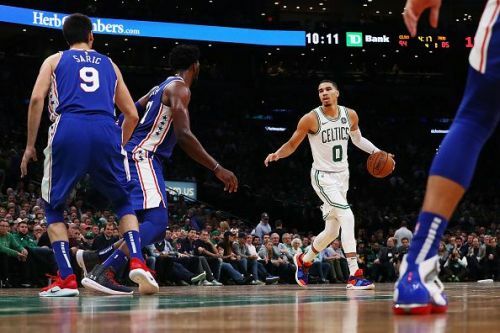 The Boston Celtics host the Philadelphia 76ers at TD Garden on Christmas Day, in hopes of beating them and proving everyone that they are still the no.1 team in the East. Currently the Celtics are ranked 5th in the Eastern Conference with a record of 19-13 while the Philadelphia 76ers are ranked 4th with a record of 22-12. The Celtics have struggled in the past few games with consistency and have failed to deliver in crunch times. Their star Kyrie Irving has been sub-par so far and needs to get things going for the Celtics to have a successful campaign this year. On the other hand, Philadelphia has been going through some of their own crisis, such as the big hole in their shooting chart or trying to identify their bench depth and how they will cope with strong teams like Toronto and Golden State Warriors when they face them. For the 76ers, Joel Embiid has been their clear superstar with big-time numbers like 26.4 ppg and 13.2 rpg. He has been very dominant throughout the season and has been a very strong defensive presence as well. He might even end up in one of the All-NBA Defensive teams this year. As for the Celtics, they expected Jayson Tatum to break out and Kyrie Irving to play like an MVP and carry them swiftly throughout the season and even into the playoffs. But, sadly for them, they have a lot of problems which they need to address, including identifying their clear top 5 and who are their most trusted players. Who can they trust when the game is on the line?